Freestanding Design eliminate container set up and is designed to transport regulated solid waste, loaded or discharged by gravity. 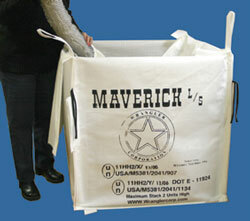 The multiple layers of woven polypropylene encapsulate the fiberboard to protect it against inclement weather. The lightweight design increases the amount of actual material being shipped per truck load and is ergonomically designed to reduce potential strains and worker injury. Click here for detailed product specifications (product code, sizes, quantities, etc). © 2007 Integrity Absorbents - All rights reserved.